AeroForce Three-stage cleaning system uses patented debris extractors to clean the floor more effectively. Just press "Clean" or schedule to clean whie youre not home. Navigates under and around furniture and through loose cords without damaging household objects. Works on hard floors and carpets. Cleans along wall edges useing a spinning side brush for the most thorough floor coverage. Cleans on a schedule that's convenient for you. HEPA filter traps pet dander, dust particles and other allergens. Automatically charges itself between cleanings. Detects the finest particles and concentrates cleaning using persistent pass. Detects dirtier areas and cleans them more intensely. AeroForce Extractors eliminate the hassle of hair-tangled brushes. A deeper clean at the touch of a button, every day. iRobot Roomba 800 Series Robots are the ultimate high performance robot vacuum cleaners. This base Roomba 865 model features the revolutionary AeroForce Three-stage Cleaning System and AeroForce Extractos and is proven to remove up to 50% more dirt, dust, hair and debris from all floor types with less maintenance hassle. Vacuuming couldn't be easier than with Roomba 865. Just pree "Clean" and Roomba gets on with it's work. It finds its way around effortlessly, avoids obstacles, vacuums under furnishings and effectively cleans every area, covering the floor and focusing extra cleaning energy where it's needed most. Roomba 865 is ideal for allergy sufferers and pet owners and it's also virtually maintenance-free. You don't even need to be at home to do the cleaning! Simply set up the schedule and you can go out and then come home to beautifully clean floors. Manoeuvres under and around furniture, beds and curtains. Works in cluttered rooms without damaging furniture or fragile objects. Tangle-Free AeroForce Extractors virtually eliminate the hassle of hair clogs and jams and are faster to clean than vacuum brushes. 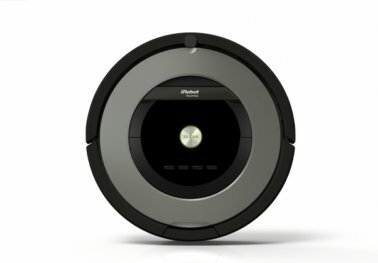 iRobot XLife Battery delivers twice as many cleaning cycles as previous Roomba batteries, doubling the time before a replacement battery may be needed. Revolutionary cleaning system delivers maximum cleaning performance to remove up to 50% more dirt, dust, hair and debris from all floor types. Tangle-Free AeroForce Extractors break down debris and lift dirt while the brushless design is virtually maintenance free. The Airﬂ ow Accelerator concentrates airﬂ ow to multiply vacuum power. The High-Efﬁ ciency Vacuum maximises the vacuum power for optimised cleaning efﬁ ciency. 5x more powerful vacuum than previous Roomba models.